ASX Clear is the Clearing House for all shares, structured products, warrants and ASX Equity Derivatives. Trades executed on ASX Trade, or the trading platform of an AMO, are submitted to ASX Clear for registration. Once accepted by ASX Clear, each cash market trade is replaced, by way of novation, with a cash market CCP transaction between each participant and ASX Clear. Where the cash market trade is cleared on both sides by the same clearing participant, there is no need for novation and the participant receives notification of the trade, for their information only. On the evening of T, ASX Clear nets all cash CCP transactions to create one net receipt/delivery per line of stock and one net cash payment/receipt per clearing participant. Generally, where a stock is undergoing a corporate event, the netting facility is turned off and the gross transaction is retained through to the settlement cycle. The resultant transactions of ASX Clear are submitted to ASX Settlement for settlement in the CHESS batch on the morning of T+2. This diagram illustrates the trade through to settlement process. ASX Clear services are provided to clearing participants, who are typically brokers or clearing and custody service providers. The two key benefits to clearing participants are netting efficiencies and counterparty credit protection. ASX Clear is approved as a ‘netting market’ for the purposes of the Payment Systems and Netting Act. This enables the netting of settlement obligations in each individual equity, providing greater market efficiency at the time of settlement and reducing participant transaction and funding costs. The left-hand diagram below depicts participant A’s trading activity in a single stock. 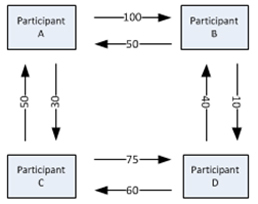 At a gross level, participant A has sold $100 of shares to, and bought $50 of shares from, participant B. Participant A has also sold $30 of shares to, and bought $50 of shares from, participant C. Post novation, participant A’s trades with participants B and C are replaced with trades between participant A and ASX Clear. 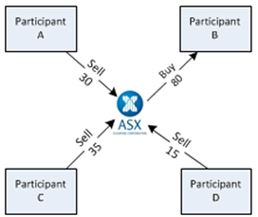 Post netting, this becomes a net sale of shares for $30 from participant A to ASX Clear (right-hand diagram). Through novation, ASX Clear provides protection to non-defaulting clearing participants (and, indirectly, their clients) from a defaulting clearing participant which does not meet its obligations. Different arrangements apply for different categories of financial product transactions. Clients, typically investors, must be fully informed and satisfied with the creditworthiness and performance risk of their clearing participant. 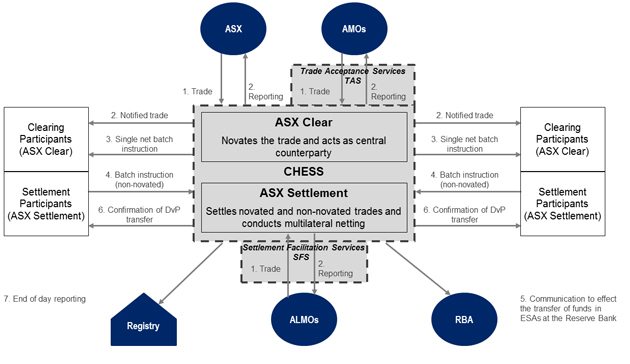 ASX Clear does not interpose itself between a clearing participant and its clients. Novation does not change the exposure that clients have if their own clearing participant defaults and cannot meet its obligations to them. Novation of transactions is dealt with in Section 12 of the ASX Clear Operating Rules. The document available here seeks to summarise aspects relevant to how and when novation of transactions occur and also when a transaction may cease to be novated. Included in that document is also information on the novation requirement that ASX Clear receives notification of the transaction. This would ordinarily occur by the relevant market operator notifying the trade to CHESS or DCS (as applicable) however in the event of a technical outage preventing such notification this could also occur by alternative means if agreed to by ASX Clear. ASX Clear intends to notify participants by way of market notice as to the approach being taken by ASX Clear in the event of such technical outage, including if trades occurring on an affected market were not being novated. Affected market operator(s) could also take action to shut their market in such circumstance and exercise any cancellation powers under their operating rules in respect of any transactions that are not novated.